If you get interested in Speyer, then you will come across the subject of the Brezel* sooner or later. 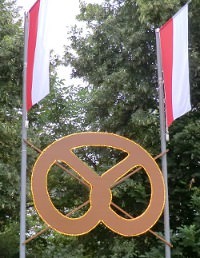 The biggest festival in Speyer is the Brezelfest, on the Sonnenplatz ("sun square") the Brezelbu ("Brezel boy") watches the market tradings, and in the pedestrian zone there is a stall of the local Brezel bakery every few meters. Indeed the locals like to call the Brezel the "national baked good" of Speyer. 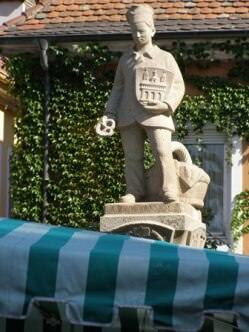 Some people of Speyer even see the Brezel as a local invention, but this can be seriously doubted. It is even unlikely that the Brezel as such was invented at all, it is more like a shape the has been evolving over the time. The oldest known depiction of a Brezel dates from the 12th century, therefore the Brezel is probably a lot older than that. Beyond dispute is that the name Brezel originates from the latin brachium = Arm, the shape is derived from the cross-armed pose of praying monks. A Brezel kann be made with all kinds of doughs, like e.g. the sweet New Year's Brezel, but in Germany people think first of the lye Brezel, which is meant with the "national baked good" of Speyer. It's a bit weird to think that somebody got the idea of dipping the shaped yeast dough first into lye before it is put into the oven. You can speculate if it was by accident, like in the popular Brezel-legend from Bad Urach, where the cat send the shaped dough into the lye, or wheter a creative cook, which was very probably a monk, was trying out all kind of things. However this happened, it is very unlikely that it had anything to do with Speyer. It may be that because of the importance of Speyer and the cathedral Brezels were baked from early on, which was something special, since the Brezel was made only for certain classes. But this is probably the whole historical relevance here. When in 1910 the first Brezelfest was organised it was supposed to boost the local economy, especially bakeries, breweries and tobacco manufacturers. The idea came up to call it Brezelfest, maybe because beerfest or cigar fest would have been too ordinary. And also, the word Brezelfest has a certain melodic sound in the local dialect. So the Brezelfest was created, and in the course of time the idea of the Brezeltown Speyer took on a life of its own. If things are repeated often enough, then it is taken as a fact, even if there is no rationale for that. The Brezels as such are unimpressed by historical disputes, and they are quite tasty, at least from the "proper" bakeries, meaning those who actually make them themselves. The fresher, the better they taste, and the best is anyway to eat them still warm from the oven. If you wish to make Brezels yourself, you will find a recipe here.